An experimental Chinese satellite failed to reach orbit Thursday (Aug. 18) when its rocket malfunctioned shortly after liftoff, according to state-run media reports. The satellite, a prototype orbiter called SJ-11-04, blasted off atop a Long March 2C rocket, but then things went wrong. 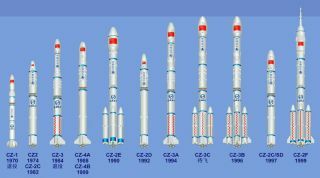 "The rocket experienced malfunction during the flight following its launch from Jiuquan Satellite Launch Center at 5:28 p.m. Beijing Time in northwest Gansu Province," according to a statement by China's Xinhua news service. "The specific cause of the failure is being analyzed." Thursday's blastoff was the third satellite launch in seven days for China. On Monday (Aug. 15), China launched the new ocean-watching satellite Haiyang-2A from the Taiyuan launching base in Shanxi province. That mission launched smoothly and the satellite reached orbit. On Aug. 12, a Chinese Long March 3B rocket launched a communications satellite for Pakistan's space agency in a mission that blasted off from the Xichang Satellite Launch Center in the southwestern Sichuan Province.